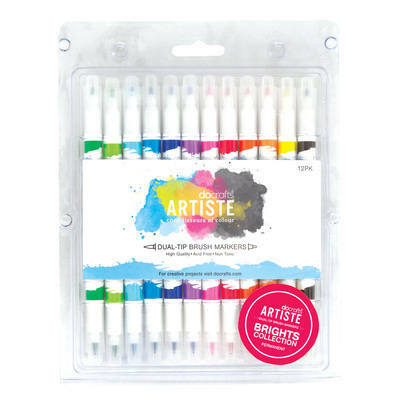 Ariste Permanent Brush Markers in 12 Bright colours. Dual tipped pens for stamping, journaling, doodling and more. Brush Marker at one end and a fine point at the other. This pack includes Green, Chartreuse, Blue, Sky Blue, Lapis Lazuli, Violet, Pink, Red, Orange, Light Salmon, Yellow, Black.